(Bloomberg) -- Daimler AG is cutting borrowing costs with a 7 billion-euro ($9.4 billion) credit line to refinance debt, three people familiar with the deal said. Growing car sales in the United States and China are helping the automaker negotiate better terms for its borrowing. The company in July raised its 2010 operating profit forecast to 6 billion euros from 4 billion euros. Daimler is offering lenders an initial interest margin at 60 basis points more than benchmark lending rates for the five-year revolving credit, said the people, who declined to be identified because the information is private. That compares with a margin of 160 basis points for a credit line it agreed to last year, according to data compiled by Bloomberg. Daimler, which owns the Mercedes-Benz, Smart and Maybach nameplates, offered lenders a 15 basis-point fee if it uses more than one-third of the credit line, and 30 basis points if it uses more than two-thirds, said the people. The facility also pays a commitment fee equivalent to 35 percent of the interest margin, which will move depending on Daimler's credit rating, the people said. A basis point is 0.01 percentage point. Daimler spokesman Florian Martens declined to comment. Deutsche Bank AG, Societe Generale SA and UniCredit S.p.A. are coordinators of the refinancing, according to Bloomberg data. 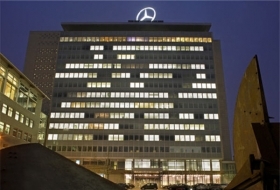 Standard & Poor's and Fitch Ratings rank Daimler's debt BBB+, the third-lowest investment grade. Moody's Investors Service rates it a level higher at A3.